Cubic Vocality, an established customer of Speedboard, welcomed HRH The Princess Royal to their Shackleford offices in December 2017. The visit was attended by a number of local dignitaries including the High Sherriff of Surrey County Council, the Mayor of Guildford and the Surrey Police and Crime Commissioner, as well as Speedboard’s Alan Butters, Richard Watson and Andy Thwaites. 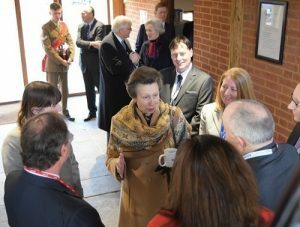 HRH The Princess Royal and guests toured the beautiful barn offices, and the Cubic |Vocality team demonstrated a range of secure communication technologies available from Cubic Mission Solutions. These included a range of Vocality unified communications products used by customers such as first responders, allied forces and critical infrastructure organisations. The Cubic| Vocality team completed their demonstrations with an overview of how they distribute video from various sources, including military drones, across a secure global network. The technology provides allied forces with the ability to easily view, manage and understand huge amounts of real-time or archived video. Following the demonstrations, The Princess was invited to meet and talk with employees and other invited guests, at a small reception held within the Vocality offices. The visit followed Vocality winning the 2016 Queen’s Award for Enterprise – the UK’s highest accolade for business success. The award was received for International Trade, in recognition of achieving outstanding export growth for the range of communications products across Europe and the rest of the world.